Conveniently order your meat when you’re not home! 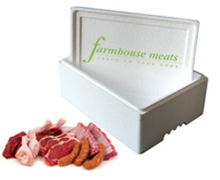 By purchasing one of our Cool Boxes for just $5 your meat will be kept below 2°C ( for up to 6 hours) until you return home. We deliver to you in vacuum sealed bags, family size serves ready to go straight in your freezer. Purchase the initial box and leave it out ready for your next order. We’ll pick up your empty box and replace it with a new one holding your order. No more queuing and no more trips into the butcher, purchasing the household fresh meat couldn’t be any easier! Order your meat and have it delivered when your not home!